President Zuma will be accompanied by a large business delegation from South Africa. He will get a 21-gun salute and a Guard of Honour mounted by the Kenya Defence Forces when formal reception ceremonies are held on Tuesday morning. 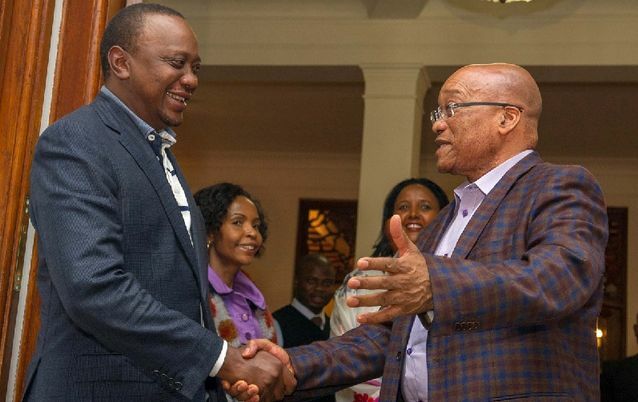 President Kenyatta will then host President Zuma to one-on-one talks, formal bilateral talks between the two governments, and then hold a news conference on Tuesday. In the afternoon, President Kenyatta and President Zuma will address a Kenya-South Africa business forum, before President Zuma returns to State House for a State Banquet hosted in his honour by President Kenyatta. We do expect that issues of trade, immigration, and security will dominate bilateral talks. The Presidents will be seeking to tackle non-tariff barriers, remove barriers impeding greater people-to-people contact between the two countries and examine ways to cooperate and collaborate in the security area in a globalized environment. Immigration is an important agenda item for Kenyans, and especially business people. It is also a matter of concern to Kenyans living in the Southern African countries of Lesotho, Swaziland, Botswana, Namibia, Malawi, Zimbabwe and Zambia. These Kenyans have raised the matter directly with the President during his visits to their region. Remove the transit visa requirement for travellers transiting through South African airports. Restrictions against other products, including but not limited to soda ash, processed meat.